The Agency Workers Regulations (AWR) were created with the aim of protecting temporary agency workers by ensuring that the basic employment and working conditions they experience is equal to that of workers recruited directly by the hirer to do the same job. Taking effect on 1st October 2011, the regulations clearly define what is required by all parties in the supply chain to ensure equal pay, equal entitlements, and equal treatment for agency workers after a specific qualifying period. Penalties for avoiding these regulations are stiff and can involve not only the repayment of underpaid salaries and benefits but also an additional £5,000 per case penalty. To avoid encountering such issues, make sure you understand all of the regulations, have clear direction as to your approach, and document everything before commencing with an assignment. Hamilton Bradbury can assist you in all of these areas—give us a call or send an email and let’s talk! Most experts believe that the AWR will become highly regulated by third-party organisations, such as the Unions and other trade bodies. We believe that certain sectors and profession levels will not be so concerned about total compliance in all areas and will take a more fluid approach to conformity. Those who take this route will typically be those in which “the going rate” and benefits are already quite high, and workers are getting a better deal than a full-time employee doing the same or similar work. What is important is to consider the overall cost of a potential claim. If an individual agency worker makes a single claim, this will be similar to a standard Employment Tribunal claim—one that is usually settled before the case is even heard. However, if a Union or Trade Body works with multiple individuals to present a class action, this type of claim can end up being incredibly costly for an agency. Legal fees, time, effort to defend, and, of course, the overall impact of back pay, benefits, and penalties, should the case go against you, can really add up. Therefore, it important to determine carefully where your business falls in the above risk levels and apply the solutions (discussed below) accordingly. The following section highlights each party’s rights and responsibilities and offer’s some advise about handling your approach. Equal treatment – access to amenities and facilities that are generally utilised by full-time employees of the hirer (e.g., canteens, lockers, uniforms, parking, memberships, and all other items that aren’t a reward for long service or loyalty). Equal Opportunity – access to all ‘relevant’ job vacancies, giving them an opportunity to apply directly for a full-time or hired position. This should include notice boards, intra net access, direct correspondence, email notification, and/or any other vehicle for making the agency worker aware. Whilst day-one rights are solely the responsibility of the hirer, it is good practice for agencies to put standard guidelines in place to make sure all hirers are aware of the rules. The Qualifying Period is the 12-week period in which the agency worker is employed with the hirer for the same or similar role. This does not take into account any natural breaks during this time such as holidays, sickness, maternity, and other statutory reasons for which the clock is paused. The period pertains to the time worked with a particular hirer, meaning that an agency worker could have already worked for the hirer before joining your business and, therefore, may have qualified for equal treatment instantly. Also, the qualifying clock resets if there is a break of more than 6 weeks from the previous hirer and if the agency worker has moved to a different hirer. Be sure to ascertain an agency worker’s previous work history and document these details before he/she starts with your business. We suggest that you investigate as far as 6 months prior to the time they join your agency. You should also keep an eye open for multiple simultaneous hirer arrangements—this ought to be a red flag and should be monitored. Of course the application of these rights depends on numerous variables; it is important to obtain all relevant details from the hirer before the commencement of any assignment. In the long run, all parties are responsible! As previously noted, it is entirely the hirer’s responsibility to ensure that all day-one rights are adhered to. However, it would be prudent for your agency to guide and assist your clients with this obligation from the outset. We strongly suggest that you analyse what your hirers currently offer and ask the necessary questions to confirm that their offerings are sufficient for AWR’s day-one requirements. It will also be worth your while to document any evidence showing that day-one requirements are met—this will satisfy a “duty of care” by your agency and strengthen any case that might be raised. For every new and existing client, we recommend that you obtain comparator information. 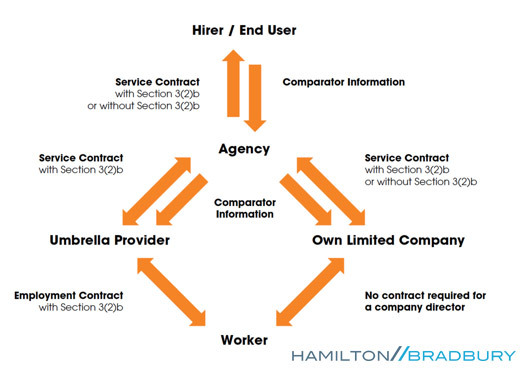 Also, be aware that your agency is required to provide comparator information in writing, within 28 days of a formal request, should a worker request it (irrespective of which model the he or she is utilizing). This information will also be required by Hamilton Bradbury and any other third party that your agency wishes to engage for the supply of and/or payment of agency workers. The above list is not exhaustive, but it should be quite helpful for getting you started. In addition to collecting comparator information, it would also be wise for you to capture the contractor’s current skill and qualification levels in all scenarios. Many agencies already document basic information, but there’s some additional information that would beneficial for you to collect—especially since any claim would be made directly from the worker. These types of questions help link a worker with a particular model/solution. We have devised a number of solutions aimed at easing the overall impact, workability, and additional costs of the AWR. Note that these solutions are not designed to help agencies circumnavigate any aspect of AWR legislation but to help you work entirely within the designed legislative framework. Contractors who will never work more than the 12-week qualifying period (or less if their occupation dictates) for a single end client are, by definition, not included in AWR; therefore, all current payroll models will be available to them, provided they are eligible for them in the first place (standard eligibility guidelines apply). Applicable models can include: standard PAYE, an Employment Umbrella (with an over-arching employment contract), or their Own Limited Company. A Section 3(2)b contract chain is mandatory for this option. Should the assignment be extended or renewed within the qualifying period or during the minimum break between assignments timeframe, this will constitute full qualification under the AWR. Therefore additional steps will need to be taken in order to comply with the AWR: equal pay, holidays, sickness, benefits, bonuses, etc. Under Option One we recommend that all standard occupation rate comparators (where possible) be in place at the start of any assignment and that strict commencement/end dates are adhered to. Option One also applies when an agency utilises comparator information and pays in full accordance with it. This typically occurs within the public sector where rate/salary levels are published and agency workers already meet or exceed these rates and benefits. Please note that equal treatment must still be fulfilled in all cases. Day-one rights are also required but remain the full responsibility of the hirer. We suggest that agencies assist hirers with day-one rights. If Option One is never breached, your agency will not incur any additional costs or burdens. However, be aware that manufacturing assignment lengths to fit non-qualifying periods could constitute avoidance under the terms of the AWR’s anti-avoidance measures. This option applies to 1) assignments that are designed to exceed the qualifying period, 2) assignments that are extended and become qualifying assignments, 3) cases in which minimum breaks are not achieved between contracts, or 4) cases in which qualification starts from day one of the assignment. The Swedish Derogation Model stipulates that when a contractor qualifies and falls under the AWR, certain benefits are then potentially due. These benefits amount to a payout of no less than four weeks between assignments and at the greater of the National Minimum Wage or 50% of the confirmed contract rate. Obviously, this option would typically require additional costs from agencies and/or end clients to cover fully the four-week requirement. However, we offer an assurance scheme that will greatly reduce your potential financial burden. Under this scheme, Hamilton Bradbury, under the employment Umbrella, will continue to act as the employer, removing all employer/employee responsibilities from the supply chain as normal. We are effectively asking for an increased marginal AWR assurance fee per pay period of up to 5% of gross salary, and in turn we will cover the entire four weeks under the Swedish Derogation model. This additional AWR assurance cost can be claimed from either your agency, the contractor directly (as a processing charge), or a mixture of both; thus, minimising any agency cash-flow issues. In essence, this percentage rise would be less than the similar cost of the employer’s National Insurance saving currently made by your agency when using an Umbrella for this time period. This particular method allows for all circumstances, assignment lengths, and extensions to be taken into consideration from day one, therefore removing the entire liability from outset for equal pay—equal treatment must still be applied under the regulations. We believe this is an outstanding solution that covers all bases while still complying fully with the legislation. The supply chain must have a Section 3(2)b contract in place for this model to work. We can assist you with changes to your existing contracts. Many are of the opinion that a contractor who has his or her own Limited Company is, by definition, outside of the AWR. In essence, this would appear to be the case. But, how would clarification of “true” self- employment and that of being “in business” for yourself sit where IR35 is clearly breached and the contractor is certainly subjected to direction, supervision, and control in the workplace? What is the “true test” for self-employment under the AWR? Can falling foul of IR35/IR56 still allow you to remain outside of the AWR? Do these factors really matter, and how can one secure true self-employed status? Thankfully, the introduction of the Section 3(2)b contract chain will minimise or even remove the risk entirely for all those who are genuinely self-employed. The chain, as mentioned before, must be replicated from the Own Limited Company to the Recruitment Business and onward to the End Client. Comparative End Client employment rates would also still need to be confirmed. The importance of this contractual arrangement should not be underestimated, as, without it, all parties to the supply chain may still be liable under the AWR. The good news is that when a claim is made under AWR’s equal pay, bonuses, and benefits rules, and when a Section 3(2)b contract is evident for an Own Limited Company contractor, the ultimate liability will rest with the Own Limited Company (and, obviously the one through which the contractor works). So in short, the contractor would have to make a claim against his own company, something that is unlikely. If a contractor is eligible to have his/her Own Limited Company, this is by far the best option for your business. Scrutiny of AWR clearly shows two real exclusions to the regulations where all of the standard rules apply to ascertaining who is an Agency Worker. These can be clearly viewed under Section 3(2) as outlined below. any other contract to perform work and services personally for the agency. there is a contract, by virtue of which the individual is available to work for the hirer, having the effect that the status of the hirer is that of a client or customer of a profession or business undertaking carried on by the individual. Is the contractor a member of a profession? Does the contractual relationship reflect this and show that the hirer is in fact the client? A vocation requiring knowledge of some department of learning or science: the profession of teaching. Compare learned profession. The body of persons engaged in an occupation or calling: to be respected by the Medical profession. Given these definitions, it follows that a person who has a profession is not an Agency Worker and is, therefore, outside of the scope of the regulations. This is true provided that “there is a contract to the same whereby the hirer is the client”. This area needs to be established both contractually and in the normal course of events and usual practices—this is relatively easy to prove when the contractor works at the hirer’s site(s). In summary, if a contractor has a profession and a Section 3(2)b contractual chain naming the hirer as the client, then all aspects showing that the contractor is not an Agency Worker are satisfied . Thus, the contractor is outside the regulations. This similarly applies to Own Limited contractors who also demonstrate that they have their own business. Properly drawn-up contracts written specifically to each model are of paramount importance to all parties in the supply chain. A sample contract/clauses to include with the hirer/master vendor, etc. In addition we produce a flow chart and questionnaire detailing specific questions that need to be answered in order for the above contracts to be completed correctly and in a timely manner. Please note that we cannot agree to any commencement of an assignment prior to receipt of a valid, signed contract. Should you require any assistance or additional information, please contact us as soon as possible. We look forward to hearing from you and helping with all of you AWR concerns and questions.